Every year is the same, the weather cools down and the snows come and our beautiful Pocono Mountains are awash in white. This also brings about yearly traditions of skiing, snowshoeing, and many other fun activities. One event that we at Ledges Hotel look forward to every year is the Paupack Plunge. This amazing and completely crazy event is one that locals and visitors love going to every year. Before the Paupack Plunge, money is raised to contribute to two wonderful organizations, Ledgedale Dive Team and Tafton Water Rescue Team. Ready to learn more about this great event and organizations? Read on to find out everything you will need to know about this year’s Paupack Plunge. This year’s Paupack Plunge will be held on Saturday, February 14th at Pocono Action Sports at the Lighthouse Harbor Marina. The way that this amazing fundraiser works is there are individuals who decide to be a plunger, which means that they will be the ones who actually will be getting into the water. While this is a daring feat all on its own, this is not the only task these plungers have. They will also reach out to family, friends, and businesses requesting for sponsorship. It is through these sponsorships and other donations that the Paupack Plunge is so successful and can help benefit these two fantastic teams. 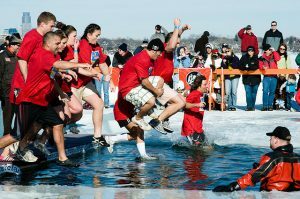 On the day of the Paupack Plunge the host cuts a hole out of the frozen Lake Wallenpaupack for the plungers to get into the lake. Each Paupack Plunge participant signs up for a certain time of the day so for those who choose to go and watch this interesting event you will be able to see plungers all day instead of for an hour or so. Also during the day there are prizes given to those who have raised the most money as well as those who have the best and most interesting costumes. Being at the Paupack Plunge is always a very enjoyable and interesting day. While the actual day of the Paupack Plunge is wonderful, nothing compares to learning about these two amazing organizations that benefit from everyone’s contributions. The first organization that benefits from the Paupack Plunge is the Ledgedale Dive Team. While this team is usually called out to water related emergencies in Wayne County, they are more than willing to lend a hand to those who need help in other parts of the state as well as other regions of the country. These brave divers go out and work tirelessly to complete their jobs. The other fantastic organization that benefits from the Paupack Plunge is Tafton Water Rescue Team. Located near Lake Wallenpaupack, the Tafton Water Rescue Team is a part of the Tafton Fire Company and assists them in the rescue of people or items on the lake as well as other areas around PA. When visitors come to Hawley and they hear about the ways we take care of our amazing first responders, it makes them want to come back and visit us for all sorts of reasons. Visitor also love staying with us at Ledges Hotel when they come for a visit. Our amazing service and attention to detail are seen throughout our hotel. We have expansive views of our gorge and showcase local art throughout the hotel. These same amazing details are seen in our rooms outfitted with Comfy sheets and eco-friendly fixtures. Ready to see some committed people dive into freezing water at the Paupack Plunge? Contact our helpful staff today and we can help you create the perfect trip.